﻿World Cancer Day: Calendar, History, Tweets, Facts, Quotes & Activities. World Cancer Day aims to save lives by raising awareness and educating the population about cancer. 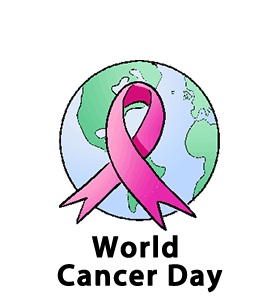 The day also serves to pressure governments and individuals to take action in order to prevent, treat and control cancers. Cancer is a heterogeneous group of diseases that result from abnormal cell growth and have the potential to spread to other parts of the body. On February 4, 2000, World Cancer Day was officially established by the Paris Charter at the World Summit Against Cancer for the New Millennium in Paris. The Paris Charter sought to promote research for a cure, prevention, services for patients and support from the global community. In 2019, a new three-year campaign will be launched called "I Am and I Will". The focus of the campaign is on individuals taking action now. The tagline for World Cancer Day 2016-2018's campaign is We can. I can. This tagline attempted to explore what society as a whole and each individual on their own can do to reduce cancer worldwide. Watch a documentary about cancer and cancer related topics. Some of our favorites are: Understanding Cancer: The Enemy Within , Cancer: The Forbidden Cures and The Quest for the Cures: Cancer . Understand the risks of smoking and urge those that you know to quit smoking. Smoking is the cause of 22% of the cancers every year. Donate to cancer research organizations. The American Cancer Society accepts donations that help with patient treatment and exhaustive research in the hopes of curing cancer someday. Join the fundraising activities to support cancer victims, their families and the continued research efforts to find a cure. Many communities offer Walks for the Cure and other types of fundraising events that can support cancer survivors or those currently in treatment.